Worshipping with Quakers in Palo Alto : Red Means Ministry! 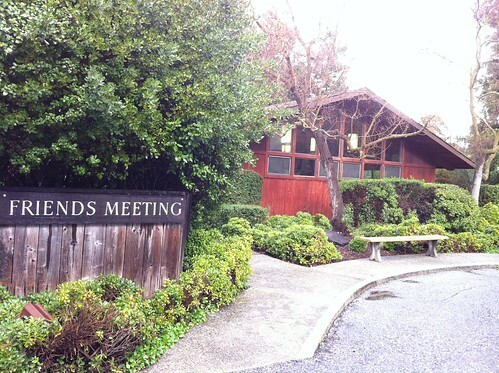 This morning I continued my "spiritual tourism" of the Bay Area, visiting the lovely Palo Alto Quaker Meeting. A number of Friends recommended this community to me, knowing of my plans to relocate to the Bay. While it's probably too far to be my main Quaker home here, I thought it was still worth a visit. Palo Alto Friends worship in a lovely wooden meetinghouse, surrounded by trees on a quiet street in the town of Palo Alto. They sit on padded folding chairs arranged in a circle instead of the wooden pews facing the front that are more common in traditional meetinghouses. The redwood, carpeting, bay windows and loft ceilings felt very homey and comfortable to me. One of the most interested aspects of the meeting room was a "message indicator" near the main door. Apparently when someone is giving spoken ministry a red light goes off on the indicator, warning those outside to wait before entering. I presume the person sitting head of meeting must have some sort of button nearby that she can press while someone is giving a message. That's pretty high tech for Quakers, and practical! I also saw microphones suspended from the ceiling. I don't know if those connect to some sort of audio amplification system for those who are hard-of-hearing. At 10:30am the meeting for worship began. There were about 40-50 attendees at the meeting I was at. While mostly an older membership, there were a number of youngsters in the youth program. There were just three messages during the meeting, all of which were brief and meaningful in their own ways. From the many announcements, Palo Alto seems like a very active meeting, with various committees, midweek gatherings, and special events going on throughout the year. Overall it seemed to be a very healthy, active monthly meeting. I look forward to coming back. Palo Alto Friends Meeting gathers for meeting for worship every sunday at 10:30am. The Meeting House is located at 957 Colorado Avenue, Palo Alto, California. Visit their website for more info and other meetings during the week.